If you go along the road from BDC flyover / Kenyalang Interchange to BDC direction, you should be able to see the sign board of "HIJAU" on your left hand side from the roadside. 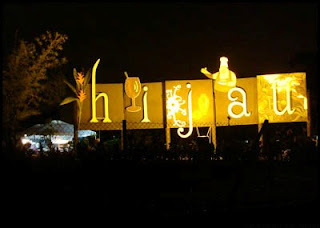 Hijau is just located at BDC area. The atmosphere there can be described as unique. It can't be categorized as just normal coffee shop or cafe either because it neither ordinary coffee shop nor cafe, what we should call huh? "Kopife"? I went there for dinner with family last Saturday and I found that the surround ambience was really comfortable with the movable air and LG plasma TV on wall! It was packed with people on that night though. The interior design is quite unique. There are many food stalls over that place, there are variety of foods to choose such as seafood, beef noodle, chicken wings, satay stalls and many more. A mini fountain was found at there and gardening thingy were found too, seems like they are doing some business related to landscaping or gardening. Well... to start the ordering, there come the drinks first. Here come the foods...I ordered a plate of Nasi Lemak, the other three companion ordered Nasi Briyani Ayam (Large), Beef Noodle, and Corn Beef Roti Canai. The price of the foods and drinks are affortable and slidely similar if compare with those coffee shop out there. It’s not easy to look for a car park and table to sit because it’s always packed, so come early to grab your table. It’s a very good place that you can hang out with your friends though, having some beers moment with your friends there. Folks! If you want to have a place to chill, or dinner. They serve softdrinks, hot and cold drinks, and have roti canai,murtabak,beef noodle,mee jawa, satay,nasi goreng kampung and curry rice, and etc. I am not sure if it's Halal place, can someone tell? This is it...HIJAU @ BDC!